How to build a Murphy bunk bed | DIY projects for everyone! Have you got a spare bedroom at home that you want to keep for guests (or visiting grandkids) but that you’d like to be able to dual purpose as an office or crafts room? 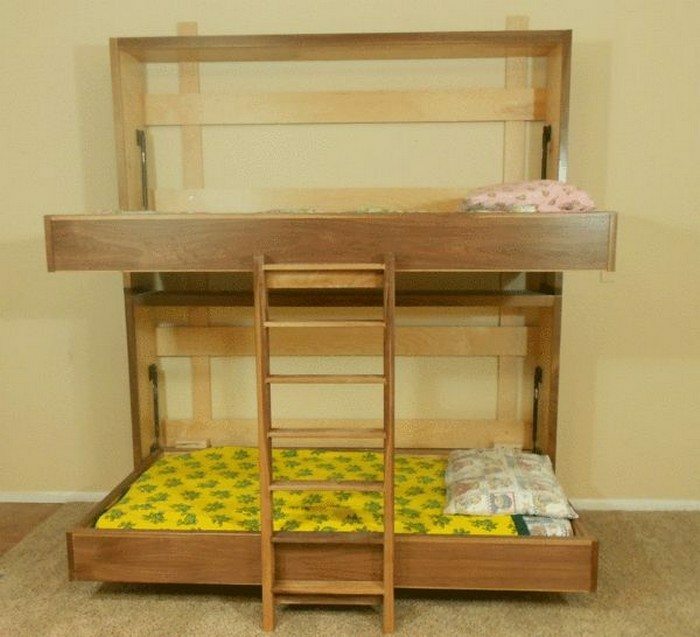 If so, a Murphy bunk bed is one of the better bed designs you should consider. A Murphy bunk bed saves space in two ways. It is vertical, making use of the available space above the first bed. And when the beds are not in use, they can be folded to make space for other activities. Do you have kids sharing a small bedroom? Do you have a home office or library you want to be available for accommodating guests? Then this is the right home improvement project for you! Be inspired by viewing our gallery of Murphy bunk beds and watch the video demonstration below. You can also find the link to the tutorial by DIY Network! Is this going to be your next big project?